The idea for this sandwich started out as a vague thought about Vietnamese-style tacos. Why Vietnamese-style tacos you ask? Well, ailment I’m not sure. I was thinking that taco toppings are like Vietnamese-style salads with generous amounts of fresh herbs, patient cabbage, onions and hot peppers. So, I tried it. I marinated some pork tenderloins with shoyu, honey and ginger. I made a slaw from mango, cucumber, serrano peppers, mint, cilantro, green onions and lime juice. (Napa cabbage would be great here, but I didn’t have any.) Then I stacked everything on a corn tortilla. Hmmm, interesting, but ultimately the corn flavor of the tortillas didn’t complement the Asian flavors. Not to be deterred, I tried again with ciabatta rolls. Much better this time! The sweet and spicy slaw was perfect on the pork and the ciabatta roll didn’t compete with the other flavors. I love a good sandwich for dinner, and I think this one might be making another appearance soon. Special equipment: I use my food processor attachment for grating. If you don’t have one, you can just chop the mango and cucumber into small pieces. Half an hour before you start cooking, marinate the meat by whisking the shoyu, honey and ginger together in a bowl. Coat the tenderloins, cover and refrigerate. Preheat the oven to 400° and heat a large, heavy skillet over medium-high. Coat the pan in a little oil or cooking spray (to prevent sticking), then add the tenderloins and marinade once the pan is hot. Sear them on each side until they become brown and the liquid reduces a bit. Tent the pan with aluminum foil and place in the oven for 25 minutes, or until the internal temperature reaches 140°. If you don’t have a meat thermometer, just slice it in the thickest part. The inside should be a very pale pink. Remove from oven and let rest for 10 minutes, then transfer to a cutting board and slice the tenderloins into 1/2-inch rounds. Return to pan and coat with any juices. While the pork is cooking, make the slaw by combining the mango, cucumber, green onions, serrano pepper, cilantro, mint, lime juice and salt in bowl. Set aside. 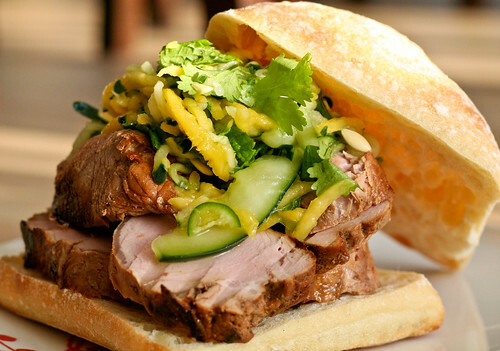 To assemble the sandwiches, halve the rolls then top with a few rounds of pork and a heap of the mango slaw. Mel your flavor combinations always make my mouth water, and then you give me the 1-2 punch with those gorgeous photos! Ooh, definitely mouthwatering and mouthwidening sandwich! Love it! This looks amazing! I will definitely have to give this a try, love the balance of flavors and textures with the cool crunchy mango cucumber slaw and salty sweet marinade on the pork! That sandwich looks so good! I like the sound of the flavour combinations. This looks great; love the idea of the fruit and fresh herbs to offset the richness of the meat. Thanks for posting. Love the combinations in this sandwich and love that you didn’t give up or settle with the tortilla! That looks so incredibly tasty! The sweet mango with the salty pork must have been just incredible. Yum! This has giving me some great ideas as I just made a loin last night. Definitely too pretty to eat! Looks fab! I am so glad you tried making this again! You have no idea how much I want to eat that sandwich… I am rather obsessed with sandwiches anyway and this looks like a fine example, I love big piles of salad in there, some nice crunch to really get your teeth into! my my, that looks phenomenal!! Just stumbled across your blog, it’s great! I loooooove bÃ¡nh mÃ¬, so I have to try this recipe. This just looks awesome. I’ll have to give it a go as soon as possible. this has to be the BEST pork sandwich I have ever seen – got to get my mouth around one of those! Replying on a blog normally isnt my thing, but i have spent an hour on the blog, so thanks for the hot infos Greetings. Maintain ‘em coming… you all do this kind of a excellent job at these Concepts… cannot tell you how a lot I, for one particular appreciate all you do! I have been making this for years and always giving the recipe out!! It is fabulous, one of our go to meal while in the tropics of south western Florida!!!! Thanks on your marvelous posting! I genuinely enjoyed reading it, you will be a great author.I will be sure to bookmark your blog and will come back down the road.